Good friends and good food are always on the menu at OKCU Dining. More than just a place to eat, it offers great atmosphere and a wide variety of main dishes, sides, and desserts for every taste. Vegetarian entrees are offered daily, as well as soup and a salad bar. A chef's station provides students with fresh, "straight-from-the-pan" meals such as hamburgers and fries, pasta, or stir-fry. 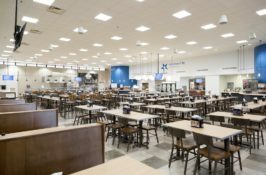 Managed by Chartwell's, OKCU Dining always offers something good to eat. Newly constructed Alvin’s Market is a convenience store concept that provides a variety of snacks including vegan, vegetarian, dairy free, and paleo options. Alvin’s also provides a wide range of health & beauty products, pantry items, and cleaning products. Inside Alvin’s Market you will also find a WPS Starbucks that offers signature coffee drinks, FANS smoothies & protein shakes, and fresh baked scones, croissants, local donuts, and other bakery items. We also offer fresh salads, wraps, sandwiches, fruit cups, parfait’s, and other various items to grab and go. Chick-Fil-A offers its standard menu items for lunch and dinner. Students are encouraged to use their points, stars cash, and meal trade at both locations. 7:30 a.m. – 1:00 a.m.
2:00 p.m. – 1:00 a.m.